At least five drones were spotted flying over the center of Paris with police unable to find who is operating them. The pilotless aircraft were previously sighted near the presidential palace and nuclear plants in what is becoming a recurring problem. The sightings of the drones come at a time when security has been heightened in the French capital following last month’s terrorist attacks, which killed 17 people. In previous months, they have also been witnessed near strategically important facilities, like nuclear power plants and nuclear submarine bases. The first drone was seen flying near the US Embassy. Police tried to follow the unmanned aircraft, but they soon lost sight of it. 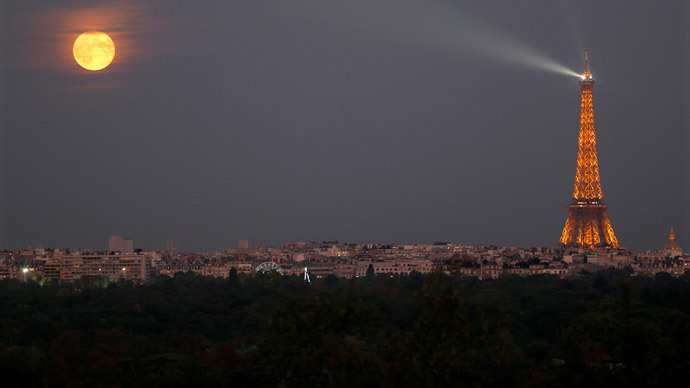 Four other drones appeared, which were spotted at locations, which included the Eiffel Tower, the Place de la Concorde and the Montparnasse tower, the tallest skyscraper in the French capital. One police source said there had never been so many drones over Paris in the same night, while another mentioned that, “It could be a coordinated action, but we don’t know for now,” as reported by AFP. Police were unable to find out who was operating the drones. French aviation and air safety expert Christophe Naudin says police will have their work cut out trying to track the drones in a city like Paris. The pilotless aircraft have been making regular appearances in Paris and beyond. On January 20, there was a sighting near the presidential palace, just a week after the terrorist attacks in the French capital. However, drones have also been seen hovering near some of France’s most sensitive installations. In October and November around 20 drones were seen flying near French nuclear power plants, while in January, small drones were spotted near a bay in Brittany that is home to four nuclear submarines. Given that France is on high alert following the recent terrorist attacks, there have been fears that the drones could be part of another terror plot. The French government is taking the threat seriously and has allocated €1 million ($1.1 million) to try and stop them. However, Naudin does not believe it is anything as sinister. “My hypothesis would be that it is some kind of ‘eco-terrorist’ group, who want to demonstrate how the state is incapable of reacting against this new kind of threat,” he said, while also adding that he believes all the incidents are related. “It appears to have been a very well-organized operation, involving several drones that may have been operated manually or on pre-programmed flights. It was done to ridicule the state and the forces of law and order and to show they are not capable of protecting the population,” he added, the Local reported. READ MORE: Catch me if you can: More drones break into France's nuclear air space. Greenpeace was initially accused of being behind the drone stunt, but Naudin believes an eco-terrorist group is responsible, saying they are probably trying to highlight the lack of security at nuclear instillations. The aviation expert also mentioned they are being operated by “real pros” and not by amateurs. Although he says they are not a threat at the moment, this could change in a few years and is a problem that needs to be addressed. French police made a series of arrests in November in connection with drones flying near a nuclear power plant. They turned out to be amateur enthusiasts who were using the pilotless aircraft to film a boat near the atomic facility. It is against the law in France to use civilian drones near state-sensitive facilities such as nuclear power plants, "which are protected by a no-fly zone that spans a radius of 2.5km and a height of 1,000 meters," AFP reports.